Although this album may not be a brand new release, I couldn’t not write a review. 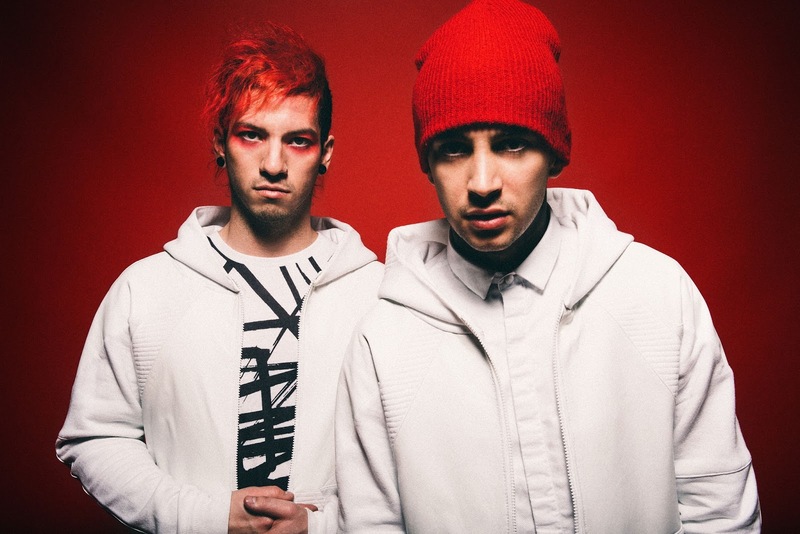 For some strange reason I have only just discovered the brilliance of Twenty One Pilots, I’m just glad I finally have because they really are amazing. Quirky and individual, their sound stands out from others and really can’t be labelled. There isn’t anyone, as far as I know, making music like this. I feel it’s my duty to make sure as many people as possible listen to their music, it’s something you can’t miss out on. ‘Blurryface’ is the fourth studio album by the American duo, every song is written by lead singer Tyler Joseph and the album seems to be very personal. The character of Blurryface was created to represent Tyler’s insecurities, I think this helps the album connect with fans because of this personal level and rawness that is absent in many popular albums. The album is crammed with musically fabulous songs, there is a definite reggae feel to the album that helps each song feel related. The combination of genres helps this band stand out from the rest, you can’t really label them at all – they’re diverse and you can expect the unexpected from them. Songs like ‘Ride’ encapsulate this feeling, the song itself is upbeat and will undoubtedly have you dancing along (or at least tapping a foot) whereas the lyrics are maybe a little less happy and more introspective and provoking the difficult questions that Twenty One Pilots always seem to weave into beautiful masterpieces. 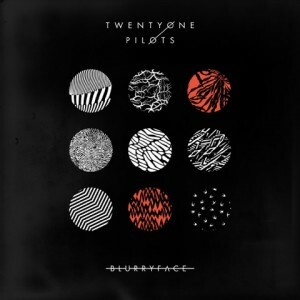 We are introduced to the character of ‘Blurryface’ directly in the second song from the album, ‘Stressed Out’. This song is brilliant and the video is too – filmed in their childhood homes it helps provide a sense of honesty. It’s hard to describe exactly what it is Tyler Joseph does; it isn’t exactly rapping and it’s not really singing. But, I can tell you its beautiful. This song has a brilliant retro feel that makes me think of being a little kid, I think the message in the song is something that everyone can connect with. The honesty expressed throughout the album is astonishing and for music lovers who may be struggling in their own fight against themselves I think that it’s music like this that helps them deal with it and make it through. ‘Heavydirtysoul’ is a perfect introduction to the album, with its strong beat that has you dancing around. I loved this from the second I heard it; there was a smile on my face and I was singing along to the chorus. Another thing this song really showcases is the sincerity of the band and the way their music extends beyond the material. ‘Tear in my Heart’ is on a level of its own. I am so in love with this song it is unreal. I don’t know if I had heard it before, but I was singing along before it had finished first time round. I’m actually struggling to put into words how great it is, because it really is just too good for words. The video didn’t disappoint either, upbeat and with a little twist and still featuring the character of ‘Blurryface’ who appears in all the videos from this album. ‘Message Man’ is one I’d point any listener to, and is one I sent to my friends to listen to – it’s a nice introduction to the band and their sound. The song itself even points out how ‘few understand’ because for many a song is just a song, but Twenty One Pilots continuously take it further. The band helpfully post lyrics below every song they post on YouTube, and what many people point out in the comments is the use of punctuation with the title ‘Message Man’ changing it to ‘message, man’ in the context of the song, which ironically (although I assume it was a conscious decision) changes the message. A good indicator of a good song is if it surpasses the boundaries of age, gender and ultimately genre. When I started listening to ‘Fairly Local’ my Dad ran in asking who was singing, he loved the song which led to their other music which he also likes. Similarly my 8 year old sister is a fan of quite a few of their songs, and although you wouldn’t expect someone with their sound or image to be quite so versatile it’s some thing they have pulled off. ‘Polarise’ is another song that falls perfectly into this category; it might just be me, but I can’t help bouncing around to the beat of pretty much every Twenty One Pilots song. I really could write a massive paragraph for every song on this album because each one is perfect, different and deserves one 100%. I think ‘We Don’t Believe What’s On TV’ sounds so upbeat and fun you almost overlook the message in the music, as is possible with all their songs and it almost allows each listener to decide just how deeply they choose to look into each one. ‘Lane Boy’ is their current single and has caused quite a stir within their fan base due to the video; as with all Twenty One Pilots’ videos its filled with metaphors and deeper meaning whilst also showcasing the endless enthusiasm and energy they have on stage. ‘Goner’ is a perfect end to the album, it really creates this feel of a journey through the album and brings everything back to basics with it’s stripped back sound for the most part. There’s a real raw feeling to the song, which makes me love it so much more, the song slowly builds up as it progresses and comes to a conclusion in terms of Blurryface. Honestly, I don’t think I’ve heard an album that I’ve loved quite this much in a long time and I definitely haven’t fallen in love with every song quite so quickly with other albums. If you haven’t bought this already, then go and do it immediately. As much as I’d love to write something for every single song on this album I fear that could go on for a while, so if you’d really like to know feel free to email me (details on the about page). Keep an eye out for these boys, they are up to great things!